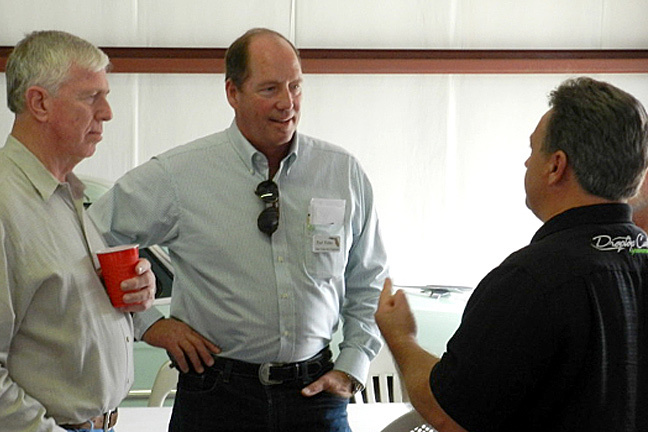 Ted Yoho was recently selected as the Republican nominee for Congress from Florida's third district. He defeated a much more well-financed opponent and in this editorial outlines what he hopes to bring to Washington should he be elected in November. Last week, I was incredibly honored as the people of north central Florida’s third congressional district chose me to be their Republican nominee for Congress. It was a great victory in so many ways. For one, we were a rag-tag campaign with only one paid staffer (our campaign manager, Kat Cammack) and a handful of dedicated interns and volunteers. We raised only $300,000 compared to the massive war chest of $2.5 million that my opponent Rep. Cliff Stearns was sitting on. I had never run for or held political office in my life. We were facing a conservative congressman who had been in office for 24 years. There were two other local politicians in the race as well, making it a difficult contest. To say the least, the odds were against us. I’ve been a large animal veterinarian and small business owner for the last 30 years. My wife Carolyn and I worked our way through college and built our version of the "American Dream." No one ever gave us anything - we worked for it. When we won, reporters descended on our campaign from all over the nation asking everything from how we won to what we were planning to do. A lot of them couldn’t believe that a small country veterinarian could be Florida’s next congressman. Reporters even asked if I owned a suit. Going from farm to farm and ranch to ranch, you become acutely aware of how government affects people’s lives and you pick up a kind of "barnyard philosophy." As a large animal veterinarian, you don’t survive long without some common sense. It was through my work as a vet that I came to realize that our government was lacking the most basic principle in Washington; common sense. I have a story that I tell often on the campaign trail that really illustrates how government has lost its way. I have an acquaintance who is a watermelon farmer who also grows peanuts, and melons. He had a young man straight out of college visit his farm one day asking to inspect his operation. This young man was carrying a book about four inches thick that was filled with rules and regulations. After inspecting the facility where they cleaned and packaged the watermelons for delivery, the young man told my acquaintance, Freddy, that he could receive a fine for having a wood handled broom to close to the melons. He told Freddy that he would need a broom with a metal handle. When Freddy asked him why, the young man replied that wood is porous and thus could contaminate the watermelons with germs. Freddy responded, "Son, we take a seed, put it in the dirt and a watermelon grows up from that dirt. It continues to sit on that dirt until we pick it, clean it off and then put it in a cardboard bin. That cardboard bin is made from cellulose, a wood product. Then we put that cardboard bin on top of a wooden pallet. On top of that, these watermelons have a rind about an inch thick. But you are telling me that if I have a wood handled broom too close to the watermelons, I could get a fine?" The young man stammered, "That’s what the book says!" Folks, there just isn’t any common sense left in government. I can give example after example of just how out of touch the federal government and the administrative agencies like the Environmental Protection Agency and the Occupational Health and Safety Administration have become. I do recognize that some regulations are necessary for safety purposes, but we have reached a point where these rules, regulations and mandates are killing our businesses, the agricultural community and our way of life. As the Republican candidate for Florida’s District 3, I plan to be a very strong advocate for not just the agricultural community but for common sense. I sincerely appreciate the support from the National Cattlemen’s Beef Association and hope that I can earn the support from its members, as well.